Past guests of Uniworld, Trafalgar, CostSaver, Insight, Luxury Gold, African Travel, Brendan and Contiki save an additional $500 per person off this trip. Click here for eligible departures. Arrive at Bucharest Henri Coanda International Airport. If your cruise/tour package includes a group arrival transfer or if you have purchased a private arrival transfer, you will be greeted by a Uniworld representative and transferred to the hotel. On the agenda today —a guided tour of the infamous Ceausescu Palace. Today is your day to relax onboard, enjoying the luxuries of your river cruise ship while soaking in the spectacular scenery all around you. Come up to the Sun Deck to admire the city’s landmarks—strung along the riverbank like pearls on a necklace—as the ship sails out of Budapest toward Vienna. A variety of activities will be available throughout the day, and you’ll have plenty of time to converse with new friends or simply unwind in your riverview stateroom or suite. For centuries, people have dreamed of linking the great rivers of Europe, making it possible to travel by water across the continent between the Black and North seas. Today that dream is a reality. Prepare for the cruise of a lifetime as you travel the length of Europe through eight nations, exploring wonders of the Old World and the New, the East and the West. Sail the romantic Rhine, the serene Main and the captivating Danube, witnessing dazzling natural beauty and incomparable architectural feats. Visit no fewer than five capital cities (Amsterdam, Vienna, Budapest, Belgrade and Bucharest) and a dozen towns and villages, with time to explore each. Enjoy numerous UNESCO World Heritage sites, including the castle-dotted Upper Middle Rhine Valley and magnificent Cologne Cathedral. From Amsterdam to Bucharest, you’ll visit the best of Europe with its spectacular architecture and stunning history on this truly remarkable journey. Who will enjoy this cruise/tour? Travelers wishing to discover Europe’s past and present, from east to west, Amsterdam to Bucharest, on one astonishing journey. 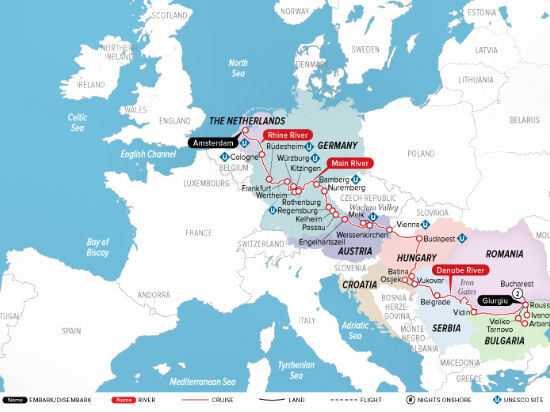 Ultimate European Journey is a combination of Highlights of Eastern Europe and European Jewels. Prices exclude additional port charges of $590 per person.